Peter Boulanger grew up in Vancouver, developing numerous skills in Gymnastics, Theatre, and Dance. In 1988, Peter moved to Montreal where he had a chance to combine these passions at L’Ecole National du Cirque, Canada’s National Circus School. Touring later with Le Cirque du Soleil, Peter met his wife, finding a creative and romantic relationship and the two travelled and performed around the world doing street theatre at fairs in France, corporate and festival work across North America and performances with 12 different Symphony orchestras. Peter was always fascinated with design, creating a 34 Ft marionette capable of lifting circus acts in its hands, an eagle with a 60 Ft wingspan, giant horses and a dozen or two new circus apparatuses. He learned how to “Tig weld” aluminum to be able to create new forms to experiment on, and he now averages two or three unique acrobatic and sculptural creations a year. 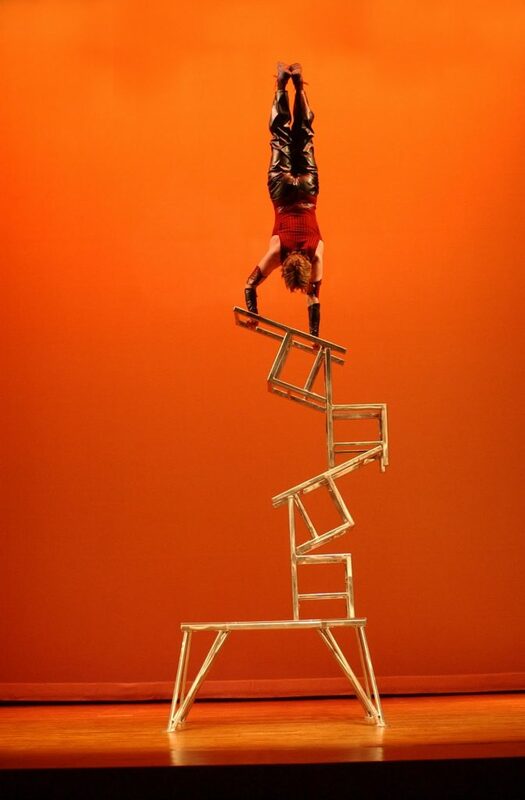 Peter’s chair balancing act “STACK”, is an example of how Peter combines traditional circus with new forms. The chairs he built have the capacity to stack together in ways that can’t be seen anywhere else. The chairs are held together by gravity and geometry and there are no pins locking them together. At 56 years old, Peter uses performance to centre himself as managing “The Underground Circus” takes much of his time. Along with Ninon Parent, Peter develops productions, trains another generation of acrobats and is always creating new forms and work shopping movement and acts with their talented crew. The danger of performing high risk balancing acts such as “STACK” requires a commitment to focusing on the moment, and keeping both mind and body healthy.